I cheated over the weekend for the Super Bowl. I decided to enjoy myself over the weekend. Saturday afternoon I went off Keto and ate a pastry with a coffee. Sunday I binged on cheese and crackers, pizza, and carbohydrate-filled potato chips! Not to mention the beer and whiskey. With the exception of the chicken wings, none of this stuff was keto friendly! Monday I woke up pretty hungover, and there's nothing better than a high carb breakfast to help ease a hangover. I opted for one more cheat day to really get everything out of my system. I had a nice breakfast complete with cinnamon rolls, sugar-filled flavored coffee, and all the buttered toast I could stomach. Like I said in my previous post, there is no try on Keto. You either do or do not. Monday evening I picked up some of my favorite sweets to snack on while watching T.V. and at midnight began fasting. I got a rotisserie chicken for dinner Monday night, and while I watched TV and ate sugary snacks I prepared a bone broth for my fast. It's now been a little over 36 hours and I've had nothing but bone broth in my system. 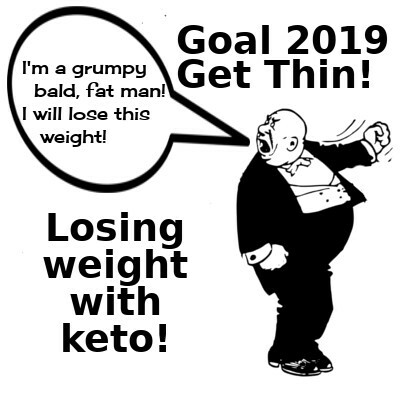 My plan is to fast for as long as I can take it, or until my keto strips say I'm in ketosis. The only thing I'll be consuming is bottled water, and chicken bone broth. The last time I did this I was back in ketosis within 5 days. I've also been jogging a mile to a mile and a half each day. I'm hoping that helps get me into ketosis a little quicker. My goal for February is to get down to the 230s by March.